Baseball Oakland – Keep the A's in Oakland! 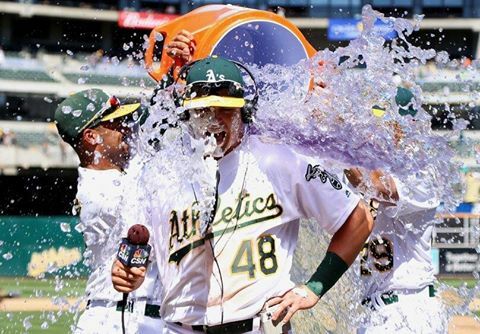 Join us and watch A’s vs. Yankees at 4pm Friday, May 26, at The Legionnaire Saloon, 2272 Telegraph, Oakland. It was a beautiful night as the Oakland Athletics won the home opener against the Angels 4-2 at the newly dedicated Rickey Henderson Field. It was a glorious day with the return of the Oakland A’s Fanfest at Jack London Square for 2017! Wolff’s marketing strategy has been to not so subtly let potential ticket buyers know that they would be foolish to go to games at the rundown Oakland Coliseum…The A’s aren’t just losing their existing fan base and tradition, they’ve lost an entire Bay Area generation. So, how will this A’s ownership (or the next one) win back the lost generation of Bay Area fans? We tried to answer that question a few years ago through a series of blogs about improving A’s marketing. And improving A’s marketing is more important than ever because if the A’s owners truly are going to build a successful new ballpark in Oakland, they have to start attracting casual fans as soon as possible. If they’re not going to spend money on keeping players — and the Reddick-Hill trade Monday only reaffirmed that notion — then they’ll simply have to work harder on public relations. And they can do that by just starting to try, even in basic ways. That sounds obvious, we know, but it’s true. Wolff and Fisher haven’t really tried to build the A’s fan base since they bought the team in 2005. Instead, they’ve been content to do the bare minimum and still make a huge annual profit while collecting more than $30 million in yearly revenue sharing from other teams’ owners. Establish a presence in Oakland and the East Bay by opening an old-fashioned “A’s Dugout Store” at Jack London Square or downtown Oakland. Sell T-shirts to A’s fans who are dying to show some Green-and-Gold pride but can’t because of the lack of stores offering A’s merchandise. And once that store is successful, you can open other branches in other parts of Alameda and Contra Costa counties. Embrace the city of Oakland. Take a page from the merch-biz playbook written by Oaklandish, which opened a successful store on Broadway, near Oakland City Hall. Oaklandish’s downtown store is always crowded with shoppers excited to celebrate their pride in Oakland. Many Bay Area baseball fans are waiting for A’s owners to show even a fraction of the same level of Oakland civic pride. As soon as the A’s do, they’ll enjoy the same success that Oaklandish earns by tapping into that market. Billboards: Wolff and Fisher spend so little money on traditional advertising that we are shocked whenever we see an A’s billboard in the East Bay. It shouldn’t be that way. In early April, the A’s surprised us by renting billboard space at 27th Street and Grand Avenue in Oakland. A few weeks later, the ad was gone of course. Since then, there’ve been few other A’s billboards seen in the East Bay. It was merely a reminder of the A’s owners’ “Do the Bare Minimum” style. The team would benefit from blanketing the area with A’s billboards, especially in the weeks and months before and after Opening Night. TV and Radio Advertising: Quick pop quiz: When was the last time you saw an A’s TV commercial on any station besides the two CSN sports channels? How can the franchise attract casual fans if it doesn’t advertise where casual fans live, work, and play? Many times we’ve heard a segment on the A’s flagship radio station, only to have it followed by a Giants commercial. Unacceptable. Knock on Doors: All other successful Bay Area sports franchises have done this. Stop by local businesses, churches, and schools and offer ticket deals and discounts. Be aggressive in doing whatever it takes to get rear ends in the Coliseum seats, knowing that ticket revenue is only part of the battle — just as much money (and perhaps more) is made from a combo in sales of parking, food-drink concessions, T-shirt and other merchandise booths, and from the local TV revenue earned from rising ratings stemming from a fan base that could be growing from the improved marketing. Stop badmouthing the Oakland Coliseum: Celebrate all that great history at the stadium at 66th Avenue & Hegenberger Road in East Oakland. Don’t malign the Coliseum, celebrate it! Most A’s fans by now know that, a) we need a new ballpark, and b) it will be built at Howard Terminal or the Coliseum site. So there’s no need to keep badmouthing the old stadium — ya’ know, the one where the A’s have played in 6 World Series, won 4 World Series titles, and made the postseason 18 times. It’s the former home of Reggie, Vida, Catfish, Rollie, Charlie O, Rickey, Eck, the Big 3, Stew, Hendu, the Bash Brothers, BillyBall, La Russa, Giambi, Tejada, Bill King, Lon Simmons, The Streak, and some baseball movie starring Brad Pitt. It’s amazing the Coliseum has all of that history. Why not celebrate it? Former A’s marketing guru Andy Dolich says it best: Any sports team owner who badmouths his own stadium is like a chef telling customers that the restaurant’s chairs are rickety, the paint is peeling, the service stinks, and the food is bad. That’s bad for business, so why do it? Pay to make improvements to the Oakland Coliseum: As long as you are there at the historic old ballyard, take a page from the Warriors, who have spent millions of dollars upgrading Oracle Arena, even as they try to leave it. Why not spend a little money to make more down the road — show a little pride and NOT take the short money each and every time. Some might point to the new scoreboard that the A’s paid for, but the A’s owners chiseled $5 million from city/county taxpayers on that deal, making sure that 50 percent of the $10 million scoreboard cost was paid for with tax dollars that Wolff and Fisher once owed taxpayers. Also, whenever this topic comes up, Wolff’s apologists like to say that, “Wolff and Fisher are only tenants and wish they could do more.” Sorry, that’s BS. Lacob and Guber are “only tenants,” too, at the Arena next door. But that doesn’t stop them from spending a little more to make Warriors games in Oakland a first-class affair. And don’t say, “Aren’t the Dubs moving soon to SF?” Sorry, that’s irrelevant. The W’s are in Oakland now and they’re making tons of money in Oakland now, making no excuses in Oakland now, and spending and doing whatever it takes to make your visits to the Arena a fun and problem-free experience. In Oakland. Now. And it’s paying off big-time for them in the bottom line. There’s nothing stopping A’s owners from doing the same. In Oakland. Now. Simple Game Day Improvements at the Coliseum: Open more concession stands. Fans shouldn’t have to walk halfway across the ballpark just to buy something basic like a hot dog. For able-bodied young fans, it’s merely annoying and likely depresses future ticket sales. But it ruins the game day experience for a single parent with several small kids, or for those fans who are handicapped or elderly. Also, by limiting the number of open concession stands, A’s owners crowd all the fans into a few concourses, and then those same owners complain about the size of those same concourses. That doesn’t add up. Also, work with the concession food company to offer a more diverse menu that better reflects the East Bay and its creative food scene. Oakland is a foodie town but you’d never know it from watching an A’s game at the Coliseum. Also, open all entrance gates at the Coliseum. Why make fans wait in line an extra long time before entering the stadium, hampering their game day experience — especially when all of those hassles can be avoided by simply opening a few more entrances. It doesn’t cost that much more. Reward your loyal fans by making their game day experience easier, more fun, and less troublesome. Also, open the entrance gates earlier for bobblehead days and other giveaways so that families, kids, and the elderly aren’t forced to sit in the sweltering summer sun for hours and hours to get the souvenir. In short, please treat your fans better in basic, easy-to-do ways. Stop badmouthing Oakland and “the challenges of this market:” We’ll say it again. In Oakland and the Bay Area, there are no “small markets.” There are only small owners. Lew Wolff, John Fisher, and Mike Crowley (and Steve Schott and Ken Hofmann before them) are your prototypical “small owners.” Oakland isn’t a small market. In fact, there are nearly 25 other ownership groups that would kill to have a market with the economic strength and public transit options of Oakland and the surrounding Bay Area. When A’s owners blame any A’s-related problems on Oakland or “this current market,” they are factually wrong — plain and simple. Blaming the market also turns off casual fans, giving them one more reason not to buy a ticket. Pay your legendary ballplayers to represent you in the community. Why do you think Reggie Jackson wears a Yankees hat everywhere he goes? Because he GETS PAID to do so, that’s why. Guys like Vida Blue, Rollie Fingers, Mark Mulder, Blue Moon Odom, Joe Rudi, Campy Campaneris, and Miguel Tejada are personable and available retired A’s legends who would be great candidates to play the same role that Mays and McCovey do for the Giants and Jackson does for the Yankees. In baseball, nothing sells like nostalgia. So, pay some of those A’s legends listed above and get them out in Bay Area communities as ambassadors for the A’s brand. Appeal to the East Bay’s Diversity. As California’s number of Spanish speakers rises each year, offer radio broadcasts of ALL 162 games in Spanish. In addition, do alternative broadcasts of the “All A’s” TV show in other languages, including Spanish, Cantonese or Mandarin, and others. Also, take a page from the Warriors’ Chinese New Year jerseys and sell more T-shirts, jerseys and other merchandise in other languages. And you can sell them in those newly opened A’s Dugout Stores we suggested above. Merchandise should be made with words in the languages of Mandarin and Cantonese and sold in Oakland’s Chinatown; in Hindi and other languages for Fremont’s large Indo-American population; in Spanish in Oakland’s Fruitvale district; and in Tagalog marketed for Union City’s large Filipino community; to name a few. There are other ideas we could share, but you get the point. We want to emphasize that these suggestions are not intended to criticize the hard-working rank-and-file A’s employees who, like Manager Bob Melvin, are asked every day to work miracles with an underpaid and understaffed roster. No, the blame for the longtime terrible A’s marketing should be squarely placed on Wolff, Fisher, and Crowley, each of whom could be doing a lot more to provide resources and staffing to market the A’s franchise better to Bay Area fans. Ann Killion was right. Through their laziness and greed, the current A’s owners have lost a generation of Bay Area baseball fans to the competition. The good news is, A’s owners can get those fans back. All they have to do is try. A few days later, those same A’s fans in Sec. 149 showed why. During Saturday’s A’s-Rays game, they unfurled two handmade signs directed at John Fisher and his A’s co-owners. “Build or Sell Fisher” and “Sign Reddick” – said the signs, before A’s security took them down. The signs reveal a growing frustration within the A’s fan base. It’s been 9 months since the Supreme Court ended San Jose’s lawsuit and Lew Wolff’s pipe dream of moving the A’s, once and for all. That court decision left no doubt about what Wolff’s and Fisher’s ballpark location options are: Oakland or bust. Commissioner Rob Manfred’s recent pro-Oakland comments made that crystal clear. So, what’s the problem? A’s ownership’s total inaction on the new ballpark front — that’s the problem. Other than the occasional vague, noncommittal quote from Wolff and a few unfounded rumors, it appears that Wolff and Fisher have made virtually no progress on a new ballpark in Oakland or elsewhere. It’s been two years since Wolff told East Bay politicians he would act “on all eight cylinders” in building a new Oakland ballpark once they approved the Coliseum lease extension. But since then, there’s been no ballpark progress from Wolff and Fisher, who’ve made it clear they value revenue sharing money over winning. Hence, the frustration from Oakland’s loud and loyal baseball fans. And, hence, the return of bleacher signs intended as a written middle finger to Wolff, Fisher, and an ownership that many A’s fans believe is an embarrassment. Manfred’s pro-Oakland comments refuted all of the usual Wolff excuses for not building in Oakland. The commissioner said he wants the A’s to build in Oakland, and that A’s owners should ignore what the Raiders are or aren’t doing at the Coliseum Complex, as that should have no bearing on what the A’s do.